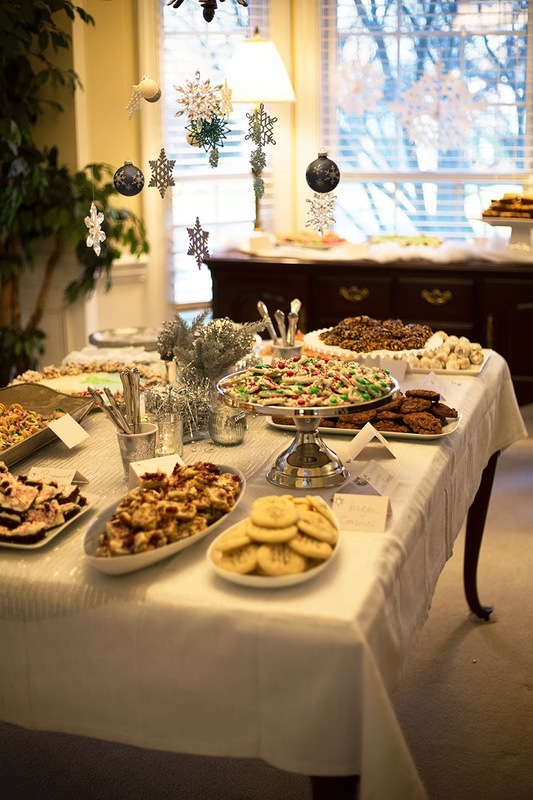 This past weekend we held our 5th Annual Cookie Party! I love that this has become an annual thing. Even though it's a lot of work, I really look forward to it every year. 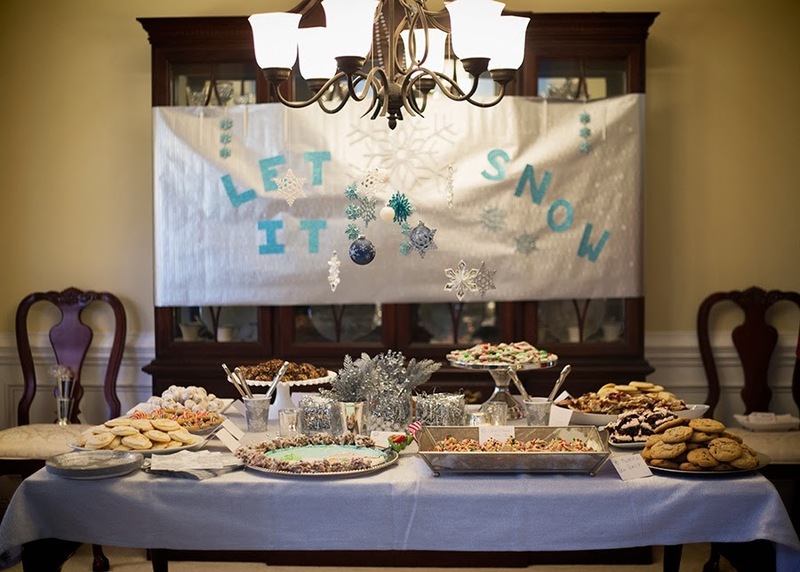 This years theme was Winter Wonderland with the colors being White, Silver and Blue. And sparkly glitter of course. This time of year I'm basically covered in glitter the whole time. 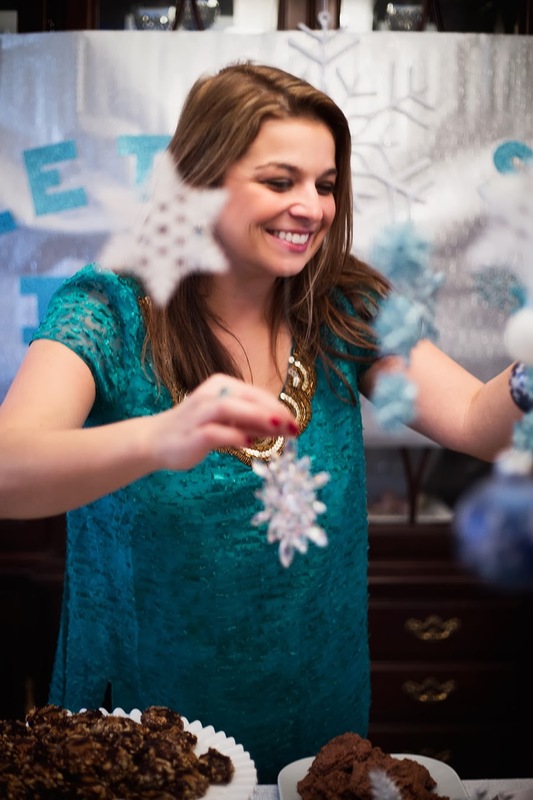 I spray painted letters to spell out Winter Wonderland on the mantel. 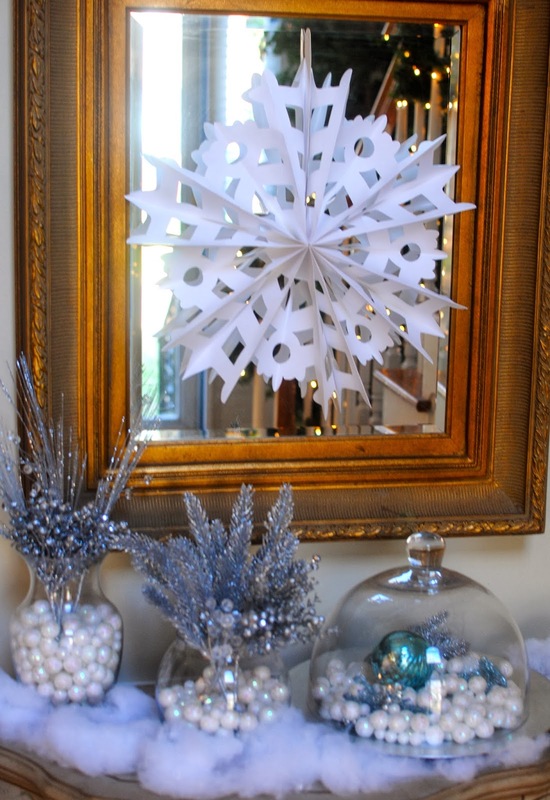 The letters were perched in snow and a snowflake garland hung below. It was 55 degrees and sunny outside, so inside we didn't we didn't skimp on the snowy wonderland. 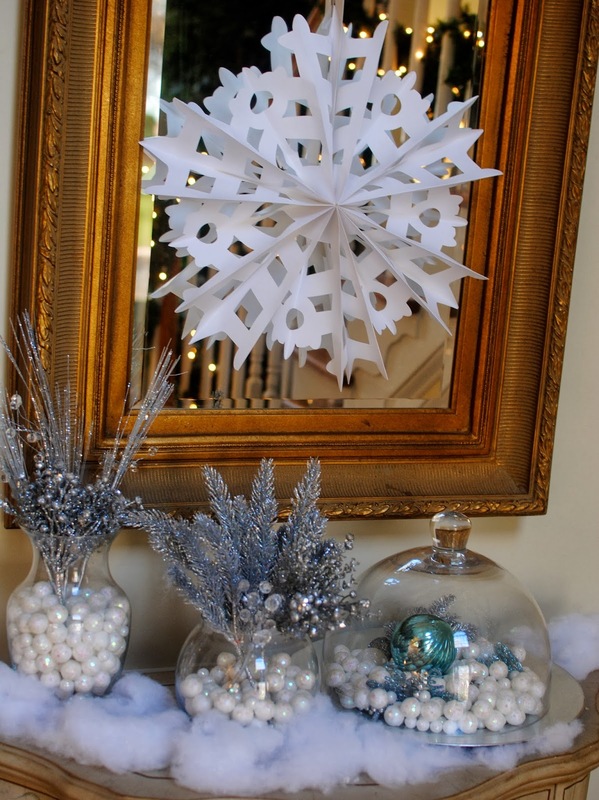 Glass vases and a cloche (glass dome) were filled with silver branches, white sparkles and blue ornaments to complete the Winter Wonderland theme! I loved how the cloche turned out, I think it would be a great centerpiece item! 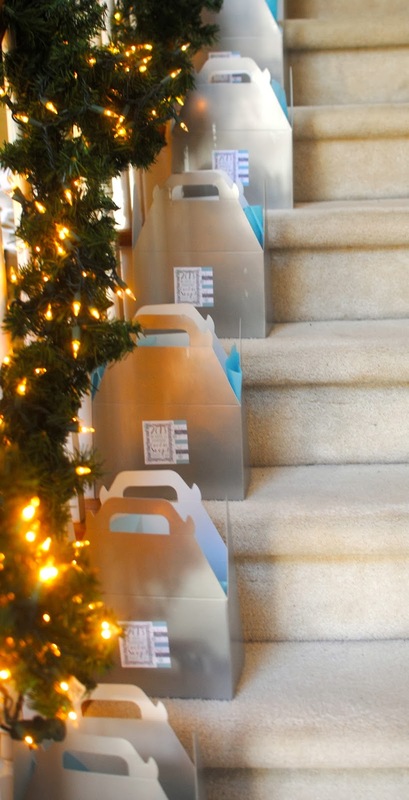 In fact, this whole silver, white and blue theme would be a great tablescape theme for your Christmas dinner table. 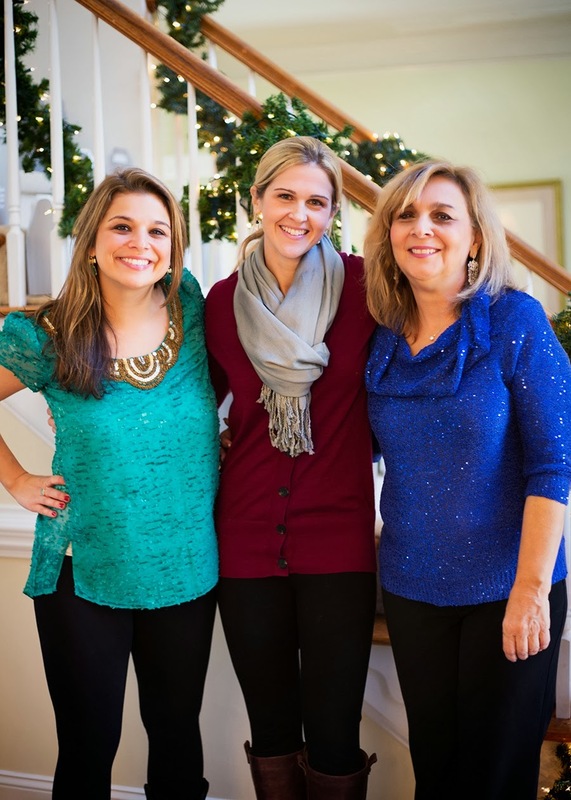 Drew (my sis-in-law and hostess partner in crime) hung ornaments from the chandeliers and it looked awesome! Sparkly, glittery trees were everywhere! 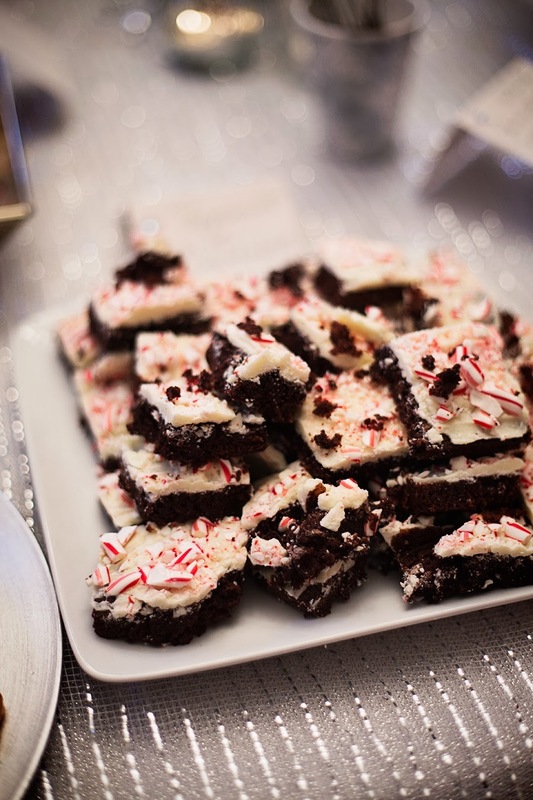 Most importantly, here were the real stars - the cookies! These chocolate covered pretzels were festive and delicious! The Pecan Shortbread Trees were delicious and adorable - in fact, they won top prize of Best All Around Cookie! 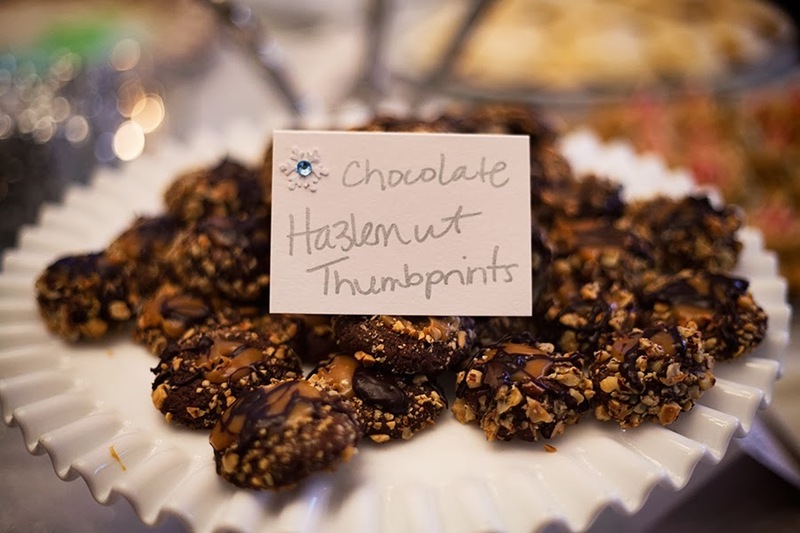 Chocolate Hazelnut Thumbprints Cookies were delicious (and another prize winner)! 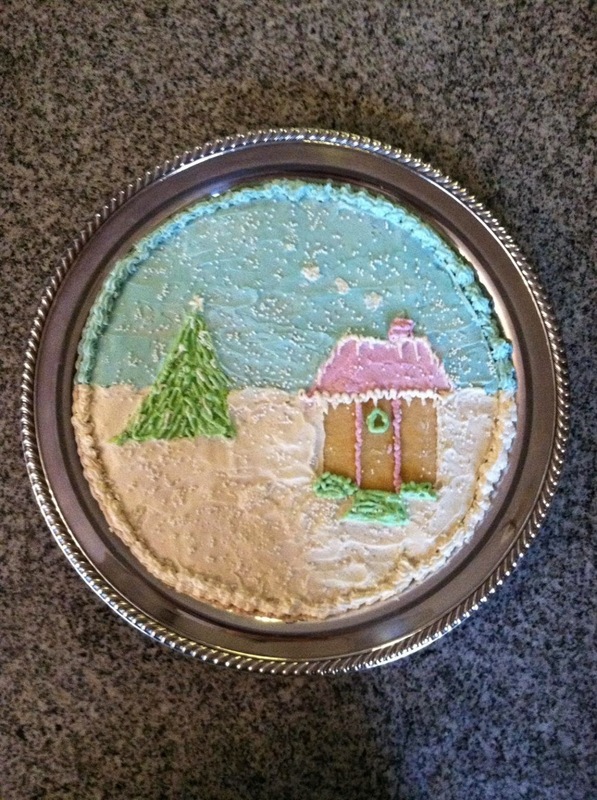 I loved this Sugar Cookie Puzzle which tied for Most Creative - isn't it adorable? The puzzle pieces fit together perfectly to make this beautiful snowy scene! Lemon Ricotta cookies won Best Tasting for their fresh lemon-y flavor! You can find the recipe HERE. 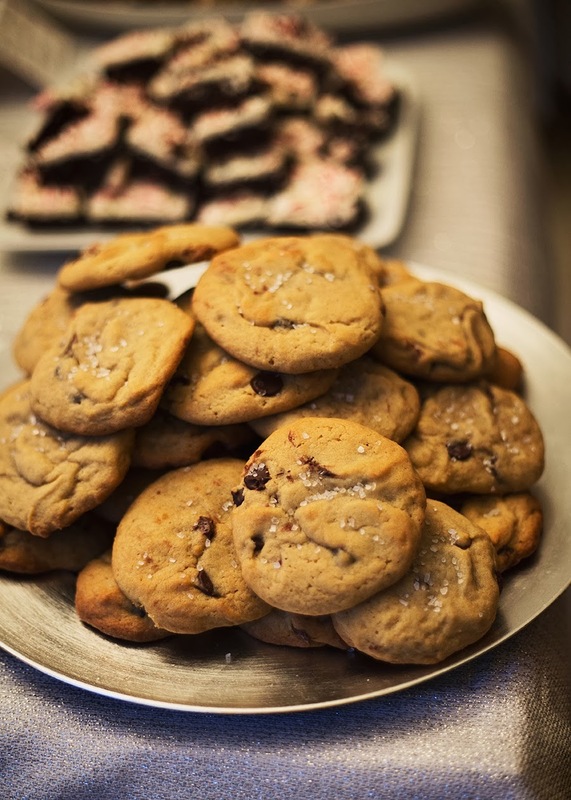 As were these AMAZING Nutella Sea Salt cookies! 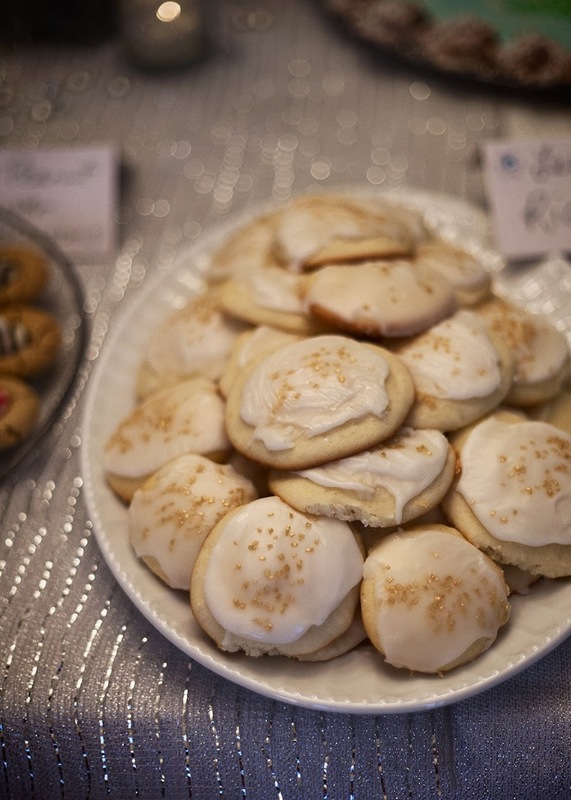 Here's a pic of all the cookies on one plate - our cookie guests know how to vote and took one bite (or more) of each! There were so many good contenders this year, people really brought their cookie A game. 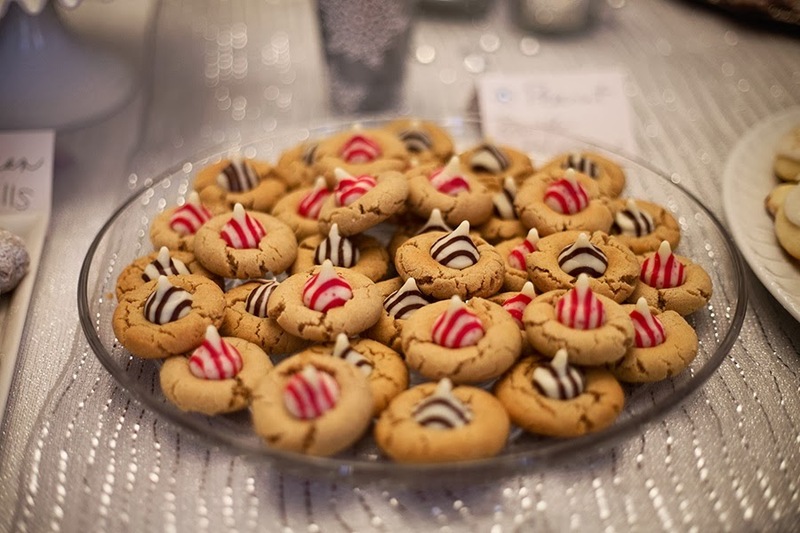 Hope you enjoyed our Winter Wonderland - we are still enjoying the cookies!! Love all the pretty and sparkly details! And those pecan trees look amazing. Another great party!